This wonderful two bedroom apartment is in a fantastic location, and comes complete with secure parking. This 4th floor property (with lift) has been expertly furnished, offering luxury and comfort for your stay. The living room provides plenty of space to relax after a busy day exploring Edinburgh, as well as offering a dining area for a delicious meal with friends or family. There is a flat screen TV in the living room, and wifi is provided throughout the apartment. The kitchen is fully-equipped, including a dishwasher, washing machine and microwave. Bedroom 1 features a double bed, and an en-suite shower room with toilet and basin. In bedroom 2 you will find a double bed. Both bedrooms have plentiful guest storage. There is also a main bathroom with a bath and shower over, toilet and basin. The location is ideal. 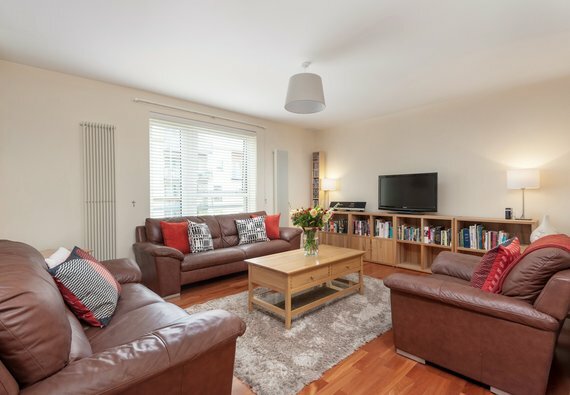 You’ll be staying at the base of Holyrood Park, with Holyrood Palace (the Queen’s official residence in Scotland) and the Royal Mile just minutes away from the front door. You’re also just moments away from the Scottish Parliament building, and popular attractions such as Our Dynamic Earth. Parking notes This property benefits from one secure private parking space. Efficient responses to inquiries. Friendly ‘meet and greet’ who explained everything and gave us a phone number if there were any problems. The apartment was well equipped and clean. The beds were of a good size and comfortable. Everything was as described on the website. A couple of minor things made me give 4 stars and not 5 stars. The bath didn’t have a plug and we couldn’t use it. There was a shower but it would have been nice to have had a soak after a days sightseeing. One of the kitchen sinks had a leak and we only found out after using it. Other than these things all was fine. From start to finish our experience was 1st class , booking was easy , the meet and greet service from Karen and the apartment was all exceptional. Fantastic friendly service. Meet and greet a great idea. Lovely apartment in a great location. Will definitely be back. Great apartment, very comfortable with everything you could want. Parking space a big plus.